The new Spotify for Android app has been widely praised (not least by me) but there were some features from the previous version that were either dropped completely or hidden away. Fear not though as there are some workarounds you can try: read on to find out how! Start Spotify on your phone. 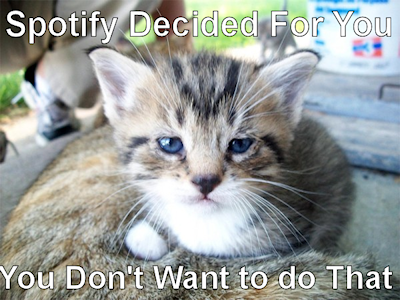 Now start Spotify on the desktop then drag-and-drop the MP3s you want to a new playlist. 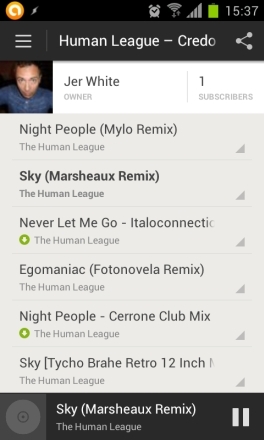 Select your phone from the Devices list, locate the playlist then set it to sync. The MP3s will be downloaded from your PC to the phone. Most of these mixes are MP3s downloaded from my PC to my phone. Of course this is a bit of a long-winded workaround and might seem daft if you already have the MP3s on your phone in the first place. But it does work! Just be sure your phone is on the same WiFi network as your PC and that you let the files finish syncing before you quit Spotify on the desktop or phone. Click All Tracks within any folder to play all tracks. The top All Tracks link will play everything in every playlist in every folder in the folder called Folder With All My Playlists. If you click Folder A then click the All Tracks link in there it will play everything in every playlist in Folder A. If you click Folder B then click the All Tracks link in there it will play everything in every playlist in Folder B etc. Once the first track starts you can click the Shuffle button (bottom-left) to shuffle the music. Long-press (press and hold) your phone’s Home button to display recent apps. Find Spotify in Active Applications then click Exit. Most Android phones let you add microSD cards to give you more storage space. With the previous version of Spotify you could tell it to cache the music on your SD card instead of the phone’s internal memory. Unfortunately there’s no in-built way to do this with the new version, but you can still set the location as follows. There are a couple of workarounds that might work for you. Firstly, try temporarily downgrading to the old version (i.e. uninstall Spotify then install an older apk), setting the storage location like you used to (press Menu from the login screen), then upgrade to the new version again. This method worked for me! A second option is to use a 3rd-party app called DirectoryBind to create a symbolic link from the Spotify cache folder on the phone to one on the SD card. CAUTION! This technique requires some technical knowledge as well as a rooted phone: attempt at your own risk! See this page on XDA Developers for details.